The Chief of the Joint Staff of the Armed Forces of Bosnia and Herzegovina, Colonel-General Senad Mašović, heads a delegation of the Armed Forces of Bosnia and Herzegovina, who is on an official visit to the Armed Forces of the Republic of Turkey. With the highest military honors the Chief of General Staff of the Army of the Republic of Turkey, General Jasar Guler welcomed Lieutenant General Senad Mašović and the BiH Armed Forces delegation. At the meeting with the high military delegation of the Turkish Armed Forces, the cooperation of the armed forces of Bosnia and Herzegovina and Turkey was discussed, especially in the field of education and training. In this regard, free training for more helicopter pilots was agreed, and additional options were also considered to enable the Turkish side to provide free tuition education for an additional number of pilots from AF BiH. During the bilateral military meeting, special attention was paid to topics related to participation in peace support operations, where the AF of BiH have significant participation, confirming their contribution to the creation of collective security in the world. In addition, other experiences in the field of security were exchanged, and in particular, the experiences of the Turkish Armed Forces in operations in the field of the fight against terrorism were useful. The visit was also an opportunity to exchange current information on the status and most important activities of the armed forces, as well as future tasks and plans. “It is jointly concluded that it is necessary to develop and improve cooperation in the coming period. The desire for further strong support to the BiH Armed Forces was expressed, in particular through military and financial assistance provided by the Ministry of Defense and the Armed Forces of the Republic of Turkey to the Armed Forces of BiH”, says the BiH Ministry of Defence in a press release. 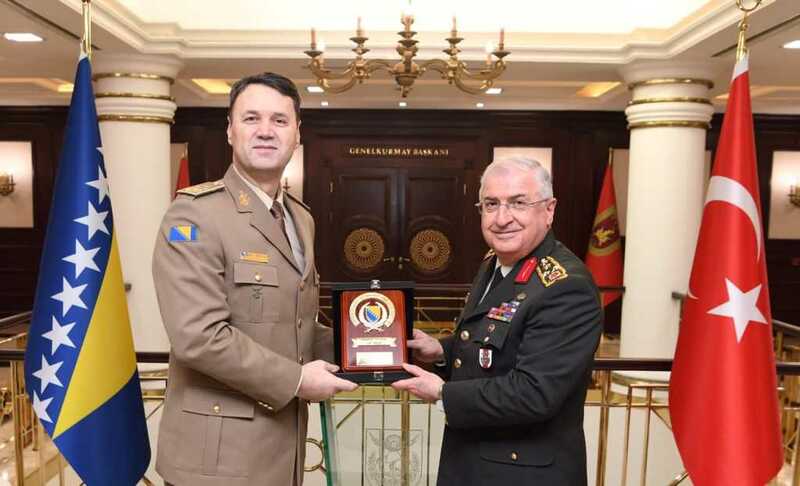 The Chief of the Joint Staff of the Armed Forces of Bosnia and Herzegovina, Colonel-General Senad Mašović, met with the highest officials of the Ministry of Defense of the Republic of Turkey. The participants discussed bilateral defense and security cooperation regarding the situation in the region with Turkish Defense Minister Hulusi Akar. Apart from the Chief of the Armed Forces of Bosnia and Herzegovina Brigadier General Masovic, Brigadier General Tomo Kolenda, Brigadier Edin Fako, Brigadier Nebojsa Bošnjak, Major Asmir Sarajlic, and Brigadier Dzemal Mašinovic, the military attachés of BiH in Turkey, are also members of the delegation of the Armed Forces of BiH.